pepperblossom decor: Shabby Apple - Modest, Beautiful, Perfect! Were so excited to share Shabby Apple with you. We've always be an "Apple" stalker. If you don't know who or what Shabby Apple is....Well, then you're MISSING OUT!!! Shabby Apple is an online dress boutique that has affordable, hip, attire perfect for work or a day to play. They are experts in modest women's dresses, little girls dresses, maternity dresses, and fashion accessories. Our favorite part about Shabby Apple is the that they only design with modesty in mind. They create beautiful, flattering dresses without losing the modesty factor. The dresses are perfectly designed to fit just about every body type...making any woman feel and look great! So you must go check out Shabby Apple and see what they're so good at. And because I'm sure you'll find something they've been gracious enough to offer a 10% discount to bloggers who get the code! Visit their page for that specific one! New Fashion Line: Carousel Line is in! With Spring Line on its way! They partnered with Unitus—a non-profit organization dedicated to accelerating access to financial services to the impoverished. Shabby Apple donates 5% of its net dress sales to support work in India helping women initiate businesses. Here's something REALLY REALLY Cool that is going on... 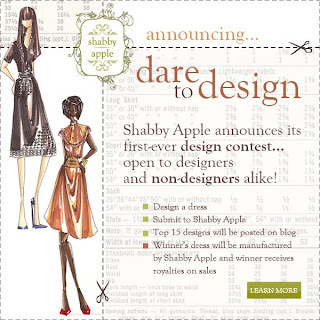 Shabby Apple is running a "Dare to Design" contest! The winner will receive a 3% royalty on EVERY dress sold of his or her design!!!! This contest if open to EVERYONE...not just professionals! Go check it out!!! LOVE shabby apple. =) that little girl is my niece!